Newer Audi and Volkswagen models have a tire pressure monitoring system, or TPMS for short. The systems are designed to automatically monitor tire pressure such that the vehicle will detect and inform you of low tire pressure at any given point — even while driving! Originally, tire pressure monitor systems had actual pressure monitors mounted inside the tires, attached to each wheel. These sensors would then send information wirelessly to a central monitoring system, giving detailed tire pressure information. The downside of this is cost and maintenance — these sensors regularly fail, and need to be replaced, which requires dismounting and remounting the tire. Most Audi/VWs are equipped with an ABS-based system which monitors the speed of rotation for each tire. When the system detects a change, it triggers a warning for a potential pressure issue. Unlike older systems, the ABS-based method requires essentially no maintenance* and no additional costs when installing new tires. The trade-off is they can trigger occasional false positives. So, what to when the light comes on? *The ABS-based systems only “real” maintenance item is the ABS sensors themselves. In other words, they add no additional maintenance to the overall vehicle versus a car without such a system. Firstly, do a visual inspection. Check if any particular tire seems to be significantly more deflated than the rest. This is a good indication of a nail or screw that tire. If nothing is visually noticeable, it is likely that either temperature changes or small parasitic leaks in the tire bead have caused a pressure change. Not to worry, this is normal! The next step is to check and adjust tire pressures as necessary. The details of this aren’t important for the scope of this article. 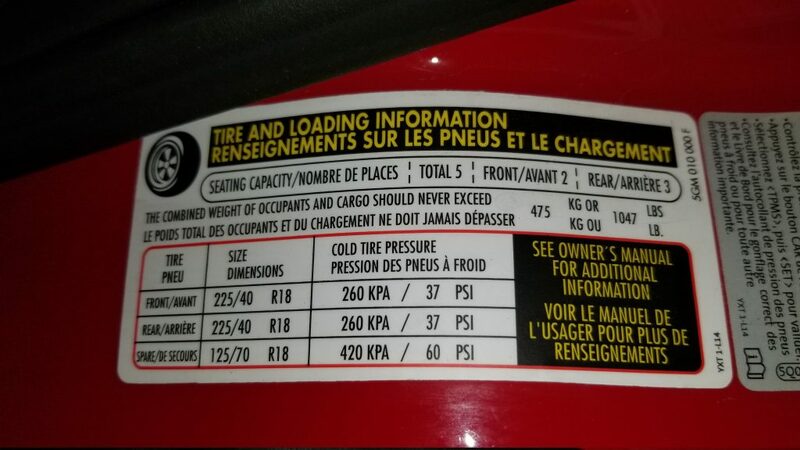 In the event you’re using a non-OEM tire size which is not specified on the sticker, the procedure is much the same. The sticker still serves as good reference point. This is because in most cases the tire size does not significantly effect recommended pressure settings. Finally, once you’ve adjusted tire pressures, it’s time to reset the TPMS light. Using your car’s infotainment system, navigate to “car” or “car systems”. From there you should see something like “Service & System Checks”. In this section, there is an option to reset the TPMS. It will ask if the pressures are correct: simply hit yes and you’re done! DAP Repair serves the Huntersville, Cornelius and North Charlotte area. We are a shop specializing in VW and Audi Maintenance, Repair and Performance.